Wow. I didn't exspect this! They changed a lot of things. The place (that didn't concern me much, story stays true no matter where it is), the fact that they changed Mr. Miyagi's name. (That had me a little worried) Actually, that was about all they changed. I know, I know, he's supposed to be the Karate Kid, not the Kung Fu Kid, I know some people get on it with that, but the way I see it is karate is a generic term, and kung fu falls under that category. I know, I know, he's supposed to be the Karate Kid, not the Kung Fu Kid, I know some people get on it with that, but the way I see it is karate is a generic term, and kung fu falls under that category. Glad you liked it! I think your dad flagged it up when I reviewed it as one he'd like to see. But really, don't make excuses for it. Calling it "The Karate Kid" was a cynical marketing move and nothing more. Karate is Japanese; Kung Fu is a Chinese term not restricted to Martial Arts and refers to focus and discipline in anything (the fighting styles are known as Wushu). Karate and Kung Fu are not the same thing. But this doesn't detract from it being a good film. Lol, wasn't making excuses, just didn't know that. Learn something new every day!! But yeah, glad you agree. I really liked the movie. The review my father posted had one thing correct: it was weird. Oh, and that subbtitles for the baby was funny!! I don't think this was a very good role for Jim Carrey. There weren't many chances for him to be as zany and outragous as we came to know him, but for such a sinister yet crazy role, who would you recommend? Idk, I guess they did the best they could as far as casting was concerned. I never read the books, so I'm not sure how dead-on it was. I remember reviewing this before and someone told me it missed adventures and skipped a few books...that or it just wasn't accurate. I can't remember to be honest. I'll leave it to that because, as I said, I haven't read it. Still, I am very into weird!! I think the movie was very entertaining. An inventor, a reader, and a baby who bites things! Above anything else this is a family-centered murder mystery. (Not so much a mystery as a "This guy did it! Why won't you believe us??" movie) All in all, one of my favorite movies in my collection! I don't think this was a very good role for Jim Carrey. There weren't many chances for him to be as zany and outragous as we came to know him, but for such a sinister yet crazy role, who would you recommend? Jim Carrey's best roles were the movies were he didn't do his zany and outragous shtick: "Truman Show", "Eternal Sunshine of the Spotless Mind", "Man on the Moon". I like both styles... though I didn't like him all that much in this movie (he couldn't save it for me). I never seen Eternal Sunshine of the Spotless Mind. I think Jim Carrey's best roles ever were "Truman Show" and "Bruce Almighty"! 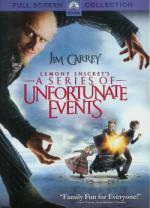 I've never seen "Lemony Snicket's A Series of Unfortunate Events". But after reading the review of Pete and his daughter (great job - thank you!) I suppose my daughter would like this film more than me. She could buy this dvd from her pocket money! Well, the only movies of his I saw other than this are Mask, Cable Guy, Ace Ventura, and I think another comdey, so I wouldn't know. Lemony Snickets is unusual, but I liked it. It reminded me of old fashioned children's stories; orphan's being dragged into a cruel and twisted fairytale. It could certainly have been better, but it's amongst Carrey's best roles at least. There was just something about the film as a whole that didn't click enough to support him. I liked this movie. It is different, but so are the books. There are like 12 books in the series - I can't remember now - and the movie condenses the first 3 books into one movie. Some new stuff is added in, though it works for the most part. I did like Carrey in this one. I would have been interested to see this continue with more movies, but that hasn't happened. ^This. Although I have not seen Man on the Moon myself. Bruce Almighty is a fun film, where he dialled back the zaniness substantially, and, being the first of his comedy stuff I saw, I woudn't turn off Ace Ventura: Pet Detective. A Series of Unforuntate Events is one of very few films that I like better than the book. And that hardly ever happens. I read the first 4 or so books and just couldn't stick with them, but I loved this film. Title: Mostly Ghostly: Who Let the Ghosts Out? The movie was created by R.L. Stine, so you know what that means? A cool family-friendly horror movie! There's not much I can say about this one, other than it is a favorite of mine to watch around Halloween, alongside Are You Afraid of the Dark? and the Rosanne Halloween episodes.